Trainer Gerald Ryan believes Trapeze Artist (r) can still win The Everest despite a wet track. 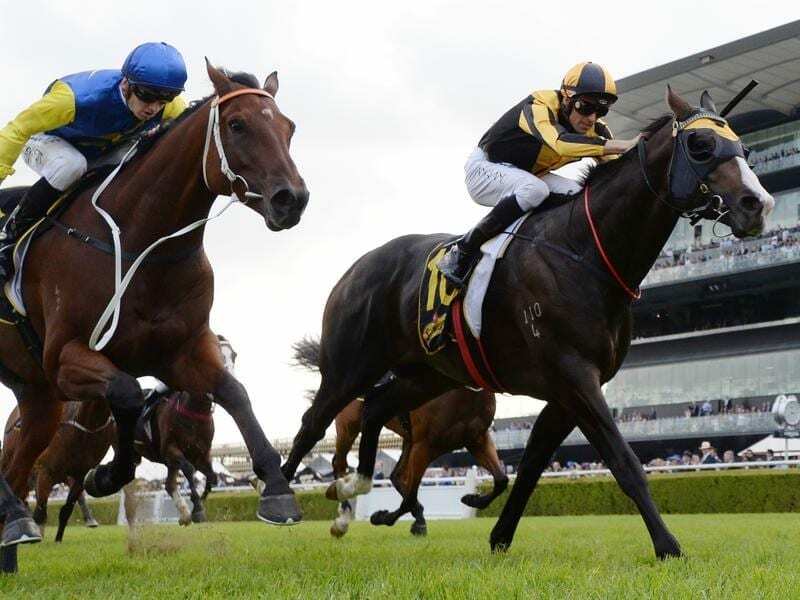 Sydney’s weather has emerged as the biggest player in the $13 million Everest at Randwick. In a tight market with the favourite changing several times in the lead-up to Saturday, last year’s winner Redzel and star mare Shoals are equal $7 favourites on race eve with punters relying on their wet track records. An unexpected downpour on Friday has kept the track in the heavy range and more rain is now predicted. Last month, Redzel was named Australia’s champion sprinter for 2017/18 ahead of Trapeze Artist who was the top three-year-old while Shoals was the champion three-year-old filly for the season. Trapeze Artist has had a turn as favourite for the 1200m-sprint but has eased to $9. His trainer Gerald Ryan would naturally prefer an upgraded surface but is certainly not discounting Trapeze Artist’s chances. “We can’t do anything about it but he’s certainly not hopeless in it,” Ryan said. “He has had three goes on heavy for a sixth in the Golden Slipper, third in the Sires’ Produce and third under 61 kilograms. Trapeze Artist is owned by Bert Vieira who knocked back several lucrative stud offers to aim him at The Everest and a possible second TJ Smith in the autumn. Vieiera’s joy at racing an exceptional horse has been superseded by concerns for the health of his wife Gai who remains in a coma weeks after a serious accident in which her car was hit by a police car pursuing another vehicle. Ryan obviously wants to win to give the Vieira family a lift . Jockey Tye Angland also has his reasons for wanting to win after losing an appeal on Friday against a suspension for careless riding. It means he misses the ride on Ace High in Saturday week’s Caulfield Cup with Damien Oliver his replacement. Newcastle trainer Kris Lees will saddle three runners – In Her Time, Le Romain and Graff – after having none a few weeks ago. He inherited In Her Time from suspended trainer Benjamin Smith, Le Romain was a late call-up after GPI Racing lost Invincible Star through injury and Graff replaced the now-retired Menari for Max Whitby’s slot. Lees diplomatically says all three have great chances but Le Romain’s form heavy track form of two wins and three from six attempts suggests the triple Group One winner could start shorter than $18. If there are any scratchings on race morning, replacements can be negotiated by slot holders from the emergencies Clearly Innocent, Dothraki, Jungle Edge, Pierata and Spright. The five are all engaged in the Group Three Sydney Stakes on the program.